Were you one of those kids who were always picky when it came to vegetables and your mother had really hard time?? Fortunately I wasn’t one of them. My mom used to run after my sisters because they were(or still are) really really picky. And so is my brother. One thing that is common in me and my brother is we love milk and spinach like anything. And my sisters are just opposite. Isn’t it amazing to see how you and your siblings are like so much alike but not so alike? God really does wonders. When I was a kid, Popeye was one of my favorite cartoons. You know why? Because Popeye loves spinach as much I do. And you know how much I love spinach? When I get to eat spinach curry you will get to see me licking the bowl good way pass after dinner time – like midnight snack. Crazy that sounds I know! 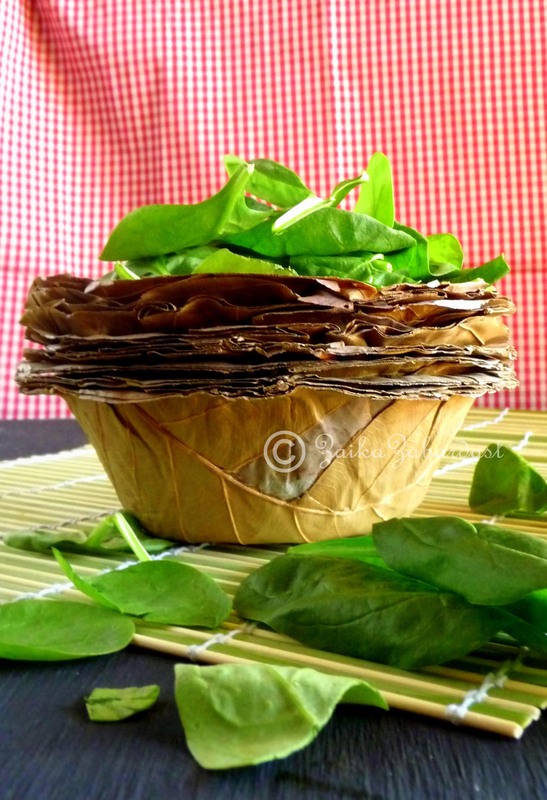 So yes, I am crazy for spinach like Popeye – the sailor man!! And that lovely Olive, oh I love her and that evil bluto, you know if I start talking about Popeye I think I will never stop so I better get back to the recipe. Palak(Spinach) Paneer (Indian cottage cheese) is not only yummilicious curry but it is super healthy and packed with nutrients. Really easy to make, all you need to make sure is you do not overpower it with spices and you are good to go. This is a Satvik (purity/simple) version of curry where you do not purée spinach and use as less spices as you can to enjoy the flavors of both spinach and paneer. Basically it’s a comfy food. 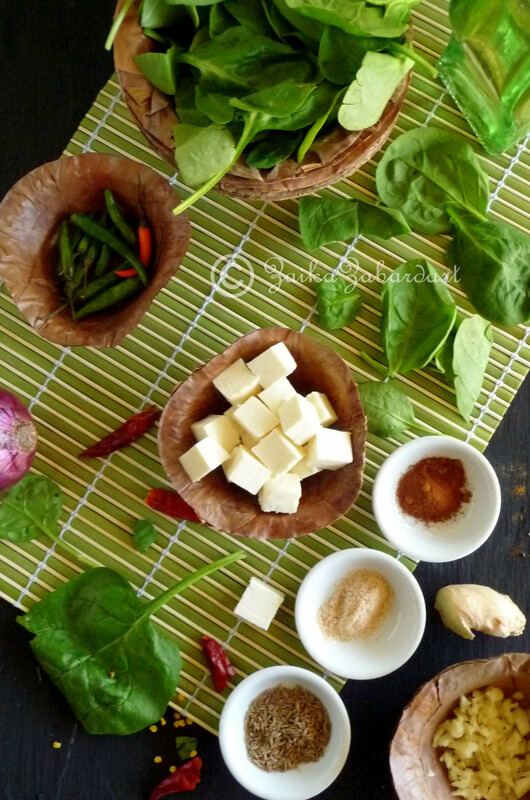 So here’s what you need to make this yummy Satvik Palak Paneer. Spinach – 14 to 16 Oz. bag that you find in salad section. If not, use 1 lb of spinach leaves. Organic frozen spinach works well too. Fill a big bowl with hot tap water and add in paneer cubes. Let it rest till you are ready to add them in curry. This way paneer will soften up and It will also get rid of the strong whey. Heat oil in a pan. Add cumin seeds and let it crackle. Add hing along with dried red chili and chopped onions. Saute until it’s translucent. Now add chopped ginger, green chili, salt along with spinach. Mix well and let it cook till the water from spinach almost evaporates. Remember, it will take longer time to cook fresh spinach than frozen. If using frozen make sure you rinse it nicely and squeeze out extra water. 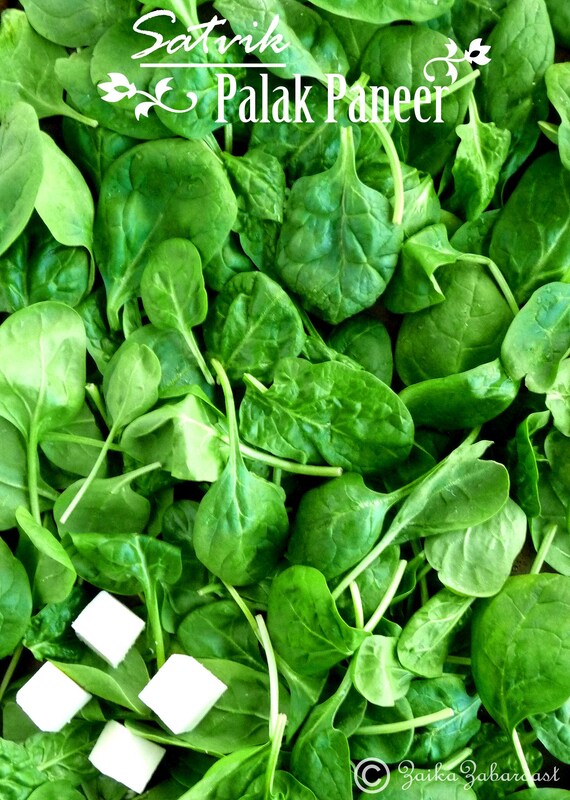 When spinach is almost cooked (it will look lumpy and dark green in color), remove paneer from water and lightly squeeze out water. Add paneer cubes into spinach mixture and mix well. Now add cinnamon clove powder along with ½ cup of water and lemon juice. Mix well, cover the pan and cook for 10 more minutes. Let the paneer absorb all the flavors and become soft. Keep checking on salt in between. Tadaa…wasn’t that super simple to make? I bet you will enjoy it. Serve with hot rotis or steamed rice! Either way just enjoy the taste of Satvik Palak Paneer. What is your favorite vegetable? And what about your favorite cartoon? ← Pumpkin Jalebi – Popular Indian dessert with an Autumn twist! Wow Grishma… What wonderful pictures, and simple recipe.. Even I am a Spinach lover, and throw that in almost everything I eat..
Love the idea of Satvik Palak Paneer .. never thought of it myself .. 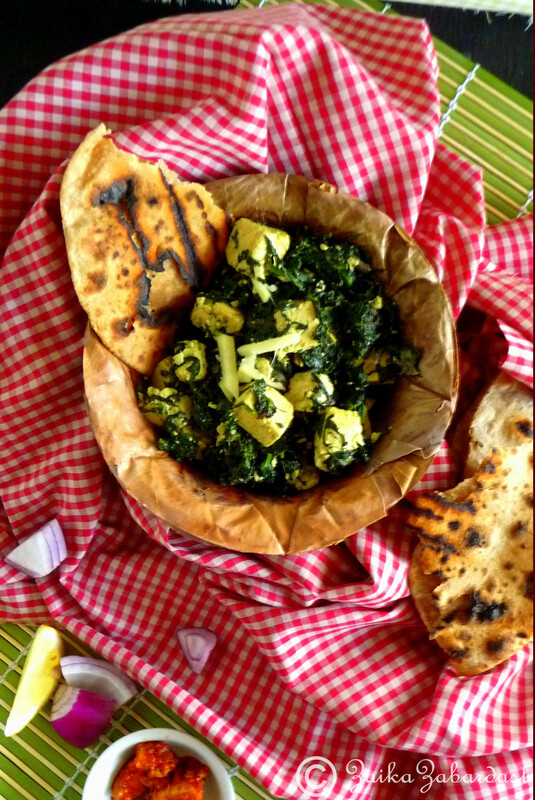 Brilliant pictures Grish…love the way you have made this palak..so simple yet so flavorful. This looks wonderful, Grishma. You say to add hing but it’s not mentioned in ingredients, what is it? Also what type of hot green chilis do you use, I assume hotter than jalapeño? I don’t know what paneer is but will look it up. Lisa, so sorry for late response. I have been really busy moving to new place. Finally got chance to catch up with social media. Anyways, thanks for pointing out that hing is not there on the ingredient list.I will update it as soon I can. Also, I use thai green chilies. And paneer is an Indian cheese made of milk. You can easily find it in any Indian grocery store around. Hope it helps!